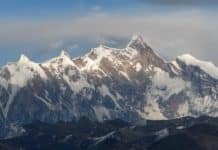 Part One of a Conversation with Ani Pema Chödrön. Training of an American Buddhist Nun. The following conversation between Pema Chödrön and Walter Fordham took place in Halifax on 10 December 2003. 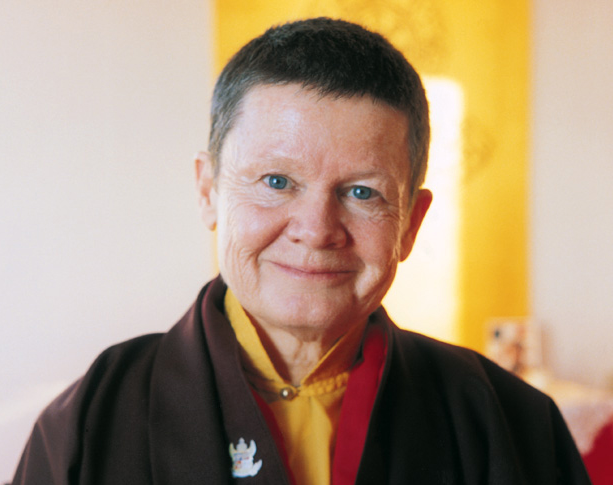 The following conversation between Pema Chödrön and Walter Fordham took place in Halifax on 10 December 2003. 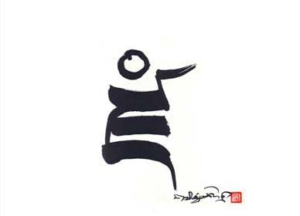 WF: How did you first make a connection to dharma? PC: To dharma at all? I was a semi-hippie in northern New Mexico living with my second husband and my children from my first marriage. It was the early 1970s, the height of the hippie times and we were surrounded by the communes and all of that. So there was no way to not be interested in spirituality, but it was very superficial, really, and I didn’t distinguish Buddhism from Sufism from anything else; it was just a lot of stuff. When the marriage broke up it had the effect of throwing me into a totally groundless state, which these days might be called a severe depression. I was scared and I was angry and I couldn’t get anything to come back together. In retrospect, it was one of these everyday experiences that people have of emptiness, really, but with no reference point to dharma. The only thing for me that was significant was that I felt it had something to teach me. So I started searching for answers. I looked everywhere, from Primal Scream for one day, and that didn’t suit me, and all kinds of things that were offered at that time. Then on the front seat of someone’s pickup I saw a magazine called Garuda. I opened it up and there was an article called Working With Negativity. When I read it, it was like a bell going off. It was the only thing that I came across that acknowledged that this was something creative, that this crisis was pointing to some deeper meaning. I think the first line of the article was, There’s nothing wrong with negativity … that it’s actually creative and very direct and very really … and I’m reading this just nodding and nodding. Then it talks about the only problem was the spin off, the negative negativity. So, for me, it didn’t have anything to do with Buddhism. It was this message from this person who wrote the article. I didn’t even know who he was. I didn’t meet Rinpoche right away, but that article on working with negativity … it really cut through. WF: That was the moment. PC: Now, Cutting Through hadn’t even come out yet, is that right? PC: But it was definitely the moment. It spoke so directly and it got me excited about what I was going through—that it was actually important. I felt that there was the potential of stripping away old ways of seeing things. It wasn’t too long after that, that I met Rinpoche. I was teaching in a school in Taos, New Mexico, a counterculture elementary school, and we read Born In Tibet in the class. These were kids from 9 to 12, I think. I sort of left out sections when it got too wordy, but I read it to them and they wanted to meet this man. And so I said, “You know he’s not so far from here. He’s up in Boulder Colorado.” So I had all these schoolchildren write letters to him, inviting him to come to see us. Before very long, we got an answer from John Baker saying it just so happened Rinpoche was coming down to Lama Foundation to give teachings. WF: Lama foundation is where? PC: Lama foundation is one of the original hippie communes right outside of Taos, New Mexico. It’s still going and it was one of the more sort of classy ones, but nothing was too classy in those days. So Lama Foundation was right there and all the Lama Foundation children went to the school I was teaching at. So basically it was a yes … we were invited to come up to Lama Foundation and meet him. I had all the children think of questions to ask and they all made presents. 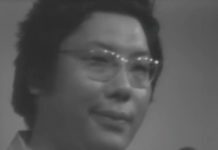 I remember one of them was the child of a potter and she made a mug for him that said Trungpa on it. I always wondered what happened to that. The night before there was a very big snowstorm. We all slept at the school and the next morning we made our way up to Lama Foundation. It was quite a journey driving up the mountain and then walking through the snow. When we got there, we were met by a man named Joshua Zim who was a Lama Foundation member at the time. 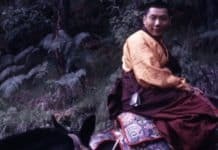 Rinpoche had sent Joshua over to where we were waiting to tell the children that Rinpoche wanted them to know that he was nothing special and they shouldn’t make a big deal about him or glorify him in any way. Rinpoche was staying in a house called the Tower House, which has since burned down. So we walked over to the Tower House, and entered on the lower level. To get to where Rinpoche was staying, we walked up these stairs into an upstairs room. As I walked up, I remember very clearly seeing his feet. His feet were on the ground and he didn’t have any shoes on and there – right at eye level as we walked up the stairs, were these very interesting small brown feet with very high arches. You probably know those feet really well. Then we came up to face level and he motioned for me to sit next to him. It was all very informal. The people that were with Rinpoche were Ludwik Turzanski, Brian Grimes, and John Baker and they were all sleeping on mattresses on the floor and so was Rinpoche — all in that upstairs room. So he was sitting on a chair probably and the children all sat down on the floor around him and preceded to ask questions … and so I remember some of those questions. One child asked if Rinpoche was ever afraid of anything. Rinpoche said that his teachers had trained him to be fearless. And then he told this story about going to a monastery when he was still quite young. When they arrived, no one was there to meet them, which was unusual, and there was this enormous dog chained up outside. It was a Mastiff with a big collar around its neck and it was very very vicious and Rinpoche and his attendants had to walk around this angry dog to get to the entrance to the monastery. The dog was frothing at the mouth, it was straining to get to them, and as they carefully made their way around the dog, the chain broke and it ran at them. 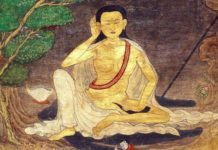 Rinpoche said, “All my attendant monks ran away … and I ran right at the dog.” The children were all just … their mouths were all open … Rinpoche paused for dramatic effect, and then he said, “And the dog was so shocked that it put its tail between its legs and ran away.” So that was his fear story. They asked lots of other questions but those are the ones I remember and then they all gave Rinpoche their presents and then they left. I must have had another teacher with me or parents or something, because when they left I stayed up there at Lama for the weekend. There were quite a few people there that later became Rinpoche’s students. There were Bhagawandas and Joshua Zim, who went to the first seminary, and there were Zeb Zuckerberg, Berkeley McKeever, Carol Mallory (I don’t know what her last name is now), myself, and Johnny McClellan and probably some others. What I remember from that weekend is going to talks down in the big dome. To get there you had to ride on horseback because there was so much snow. Aside from the teaching, what I remember is that we would stay up late late at night in Tower House — it was probably just two nights. He sat in his chair and we all sat around on the floor and we talked into the night. There are actually some photographs of this somewhere. These all-night conversations where transcribed and published as Tower House Discussions, by Lama Foundation with some pictures of Zim looking really ratty. Ed. note: Tower House Discussions are available in The Collected Works of Chögyam Trungpa, Volume Three, page 548. One day during that weekend, we all went into town with Rinpoche. He wanted to look in the native American stores — he said that maybe he’d like to get a native American rug. I had a very nice native American rug for sale in one of the stores in town. I pointed it out and said, “Would you like this one?” And he said, “Oh, very much.” So I gave it to him as a present, which was out of the ordinary for me; I needed the money and I just met him. I didn’t have it in my mind, “This is my teacher,” but it was really a strong connection. Several of us had a meal together in a restaurant with Rinpoche. 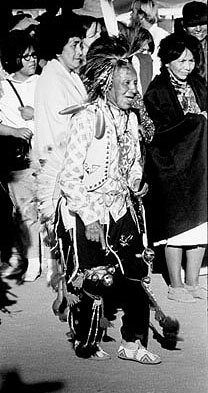 There was John Baker, Ludwik, Brian, Zim, myself, and someone named Suzie Gomez from the Taos Pueblo. I remember two things from that meal. 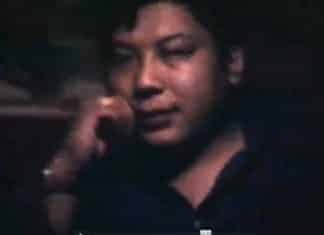 One is that when Rinpoche sat next to Suzie Gomez, they looked like siblings. They were the same shape, color, roundness, hair color … they just looked so much alike, and they spent the whole time talking about similarities in their cultures; they even found some common words in Pueblo and Tibetan. Ed. 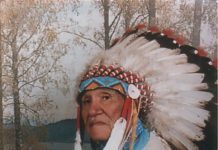 note: Suzie Gomez is the daughter in-law of Little Joe Gomez, a native American spiritual leader who Rinpoche met (perhaps during this same visit to New Mexico) and appreciated very much. But that’s another story…. And the other thing I remember is, for some reason, we all took out our drivers’ licenses and were looking at each others’ photos. John Baker looked at mine (and at the time I had bangs and long straight hair) and for some reason he said, “Are you a nun?” I remember feeling very insulted, you know….that’s like saying, “are you an uptight prude?” or something … and I remember Rinpoche sort of laughing about that. Shortly after that first meeting, I drove up to Boulder for a nyinthun with two friends — one of whom was Michelle Martin who’s now one of Khenpo’s [Khenpo Tsultrim Gyamtso] translators. She just did a book on the 17th Karmapa. It seems so funny now that we drove up for a nyinthun. But while we were there, I asked for an interview and I was granted an interview. Someone dropped me off at Four Mile Canyon. I went in, Taggie was a baby and he was toddling across the floor carrying the IChing. Well, it’s like being in the ocean when the waves are really rough and high. They knock you over and you find yourself on the floor of the ocean with your face in the sand. The sand is getting in your nose and your mouth and your eyes and the waves are holding you down. But then the wave recedes and you stand back up and you walk until the next waves comes in and knocks you down and the same thing keeps happening. And each time you just stand back up and after awhile it seems to you that the waves are getting smaller and smaller. PC: I always remember it. To this day, it’s an ongoing teaching for me. So that’s how I first met him. 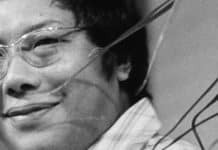 Ani Pema Chödrön, one of the first western women to become fully ordained as a Buddhist monastic, met Chögyam Trungpa when her hair was long and her name was Deirdre Blomfield-Brown. 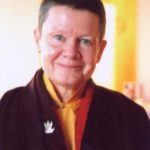 After this first encounter she moved to England where she studied dharma under Lama Chime and was ordained as Pema Chödrön by the Sixteenth Karmapa. 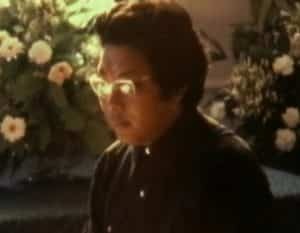 Following Lama Chime's advice, she returned to the United States in 1974 to study with Trungpa Rinpoche. 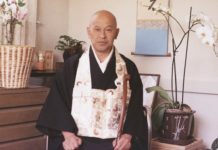 There she became a close student and a vessel for Trungpa Rinpoche's plans for a monastic tradition of Buddhism in the West. In the years since his death, in addition to nurturing the embryonic Shambhala-monastic tradition at Gampo Abbey in Cape Breton, she has become one of the best known Buddhist teachers in North America and the author of four best selling books: The Wisdom of No Escape, Start Where You Are, When Things Fall Apart, and The Places That Scare You.